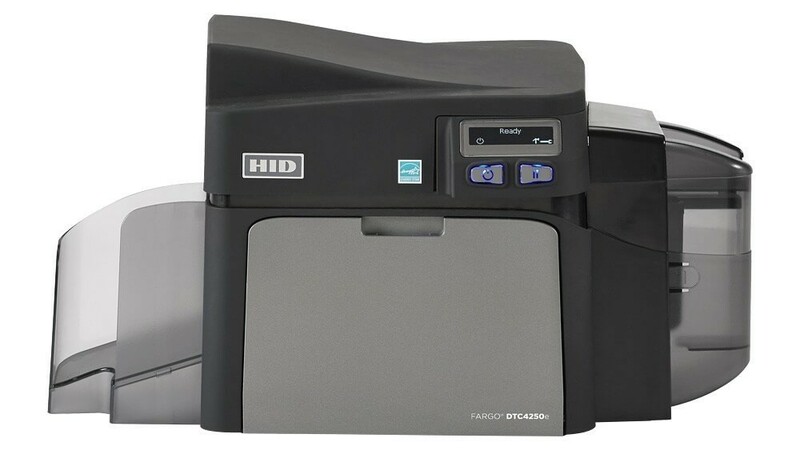 Fargo DTC4250e by HID Global is a powerful ID card printer that is great for small to mid-size businesses, schools, and local government agencies that need to print produce large quantities of extremely durable ID cards and badges quickly. Featuring a flexible and modular design that can be easily adapted whenever your card print needs change, DTC4250e is easy to use, Energy-Star Rated and can be password protected for extra in-house security. 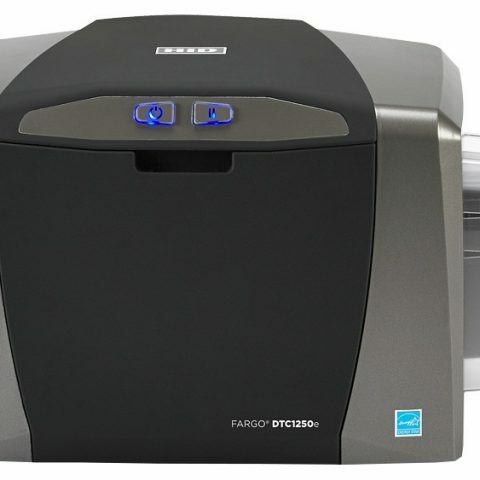 Note: Fargo DTC4250e card printer replaced the Fargo DTC4000 model. 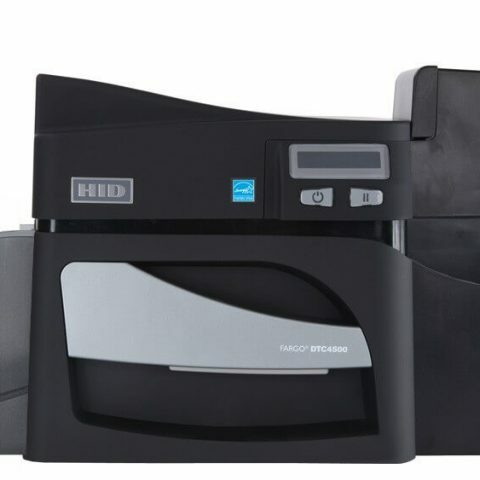 Offering reliable, flexible, secure printing, Fargo DTC4250e is a professional-grade mid-range ID card printer that remains easy to use and cost-effective. 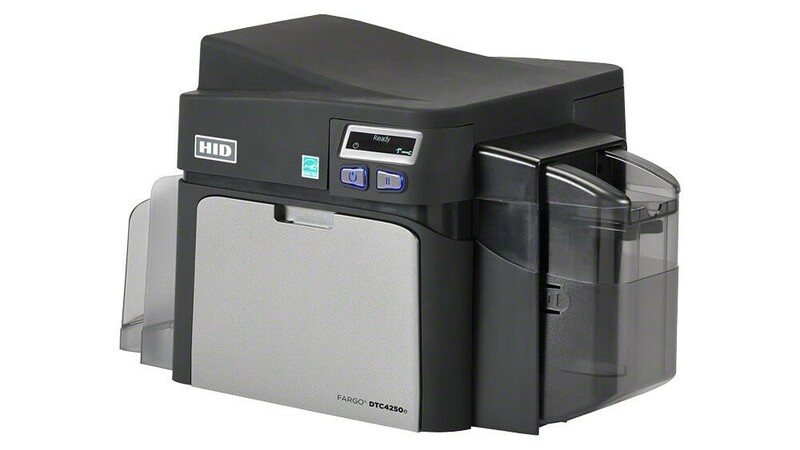 From basic plastic loyalty and photo ID cards to more sophisticated high-security access cards with embedded electronics, Fargo DTC4250e card printer will produce large quantities of extremely durable credentials both quickly and easily. Ideal for small to mid-size businesses, schools, and local government agencies, DTC4250e features a flexible and modular design that can be easily adapted whenever your organization grows or your card printing needs change. Its sleek design with changeable footprint can easily accommodate office environments where space is at a premium. The DTC4250e also features a SmartScreen graphical display with easy-to-follow prompts to ensure that youll always know printer status. Fargo DTC4250e also features new security enhancements, such as the embedded iCLASS SE smart card encoder and AES-256 data decryption for protection of financial information. DTC4250e can also be password protected so only approved operators can print and encode security cards and visitor badges. With its small footprint, an optional, same-side input/output hopperand an optional Wi-Fi accessory that allows you to print anytime and anywhere, Fargo DTC4250e consumes minimal space and offers maximum flexibility. The printer is also fully compatible with HID Global Asure ID software and Color Assist tool that can help you match spot colors, ensuring accurate reproduction of such complex graphics as company logos or employee photos. Print Anywhere, Anytime DTC4250e comes standard with Ethernet connectivity. Add a Wi-Fi accessory, so you can operate your DTC4250e wirelessly. Simple To Use Right Out of the Box Easily set-up, load and operate the DTC4250e using intuitive SmartScreen graphical display and EZ load card printer ribbons with card cleaning roller. Fargo Workbench diagnostic utility facilitates printer maintenance. Its Color Assist tool matches spot colors, ensuring accurate prints of graphics such as company logos. 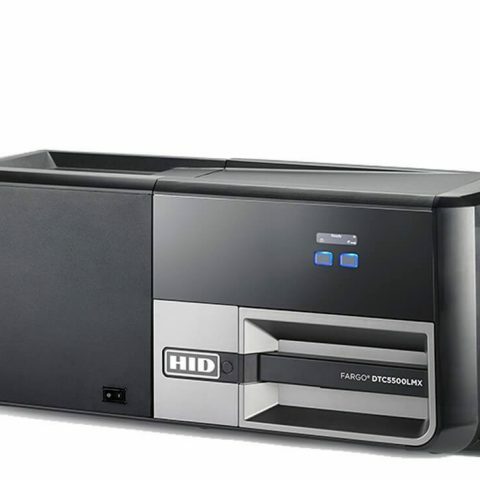 High-Volume Capacity The dual-input card hopper holds 200 cards for higher capacity printing and encoding. Wide Variety of Uses – Print on a variety of card thicknesses to create simple loyalty cards or photo IDs as thin as 9mm or high security access control badges as thick as 40 mm. DTC4250e even prints on CR79 Adhesive Back cards so you can customize your Clamshell proximity cards. Enhanced Card Printer and ID Badge Protection Standard printer password protection and fluorescent panel printing provide a cost-effective and dynamic means of increasing card security. Earth-Friendly Enjoy cost savings from the eco-friendly Energy Star Rating, as well as the DTC4250es erase and rewrite card feature, ideal for creating temporary ID cards, such as visitor badges. Customizable to Fit Your Needs Choose single or dual-sided printing and magnetic encoding options in our online store. For more information on more complex coding options, contact an ID Expert at 877-868-0012. Control, Flexibility and Security Integrate the optional iCLASS SE encoder, allowing you to create, encode (read/write) and manage secure ID credentials from start-to-finish. Optional technology card encoders that allow you to easily migrate to contact and contactless smart card technologies (including but not limited to iCLASS SE or MIFARE) or simple mag stripe and prox cards as needed. Contact an ID Expert at 877-868-0012 for more details. 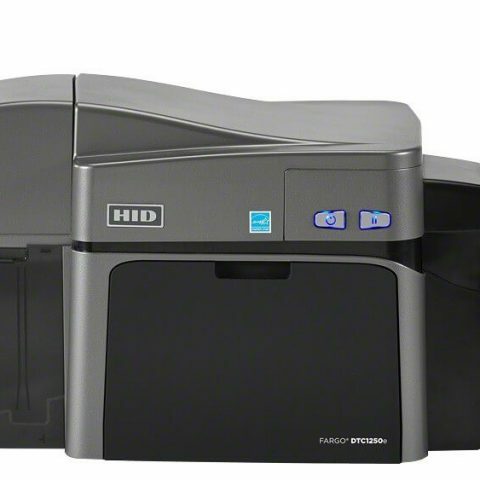 ID Card Group is an authorized dealer of Fargo and HID Global products and can help you choose the best Fargo DTC4250e printer configuration for you. Contact an ID Expert at 877-868-0012 for additional help.